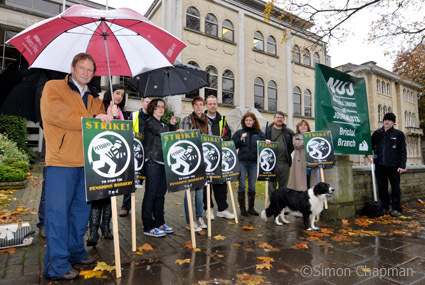 I turned up for picket duty on Friday on my bike at 8 a.m. in the pouring rain at Whiteladies Road. Despite the weather, I was glad to see several colleagues already holding placards at the back gate on Belgrave Road, the only working entrance that time of the day. They had been there since around 7 a.m. and were doing a sterling job. We were also joined by members of the Bristol branch of the NUJ, complete with NUJ dog. We then formed another line outside reception at 8.30 for its opening. It was good to see that not a single NUJ member crossed the picket lines. We did have some Bectu members either not crossing, or joining the NUJ in disgust at their leadership’s recomendation to accept the offer, despite having not secured an agreement by the BBC that takes it away from their discretion as to whether our pension gets a CPI uplift each year. I think that is the main sticking point in this dispute. Bectu members who crossed the line did so very reluctantly. Some had tears in their eyes. It was heartening to hear of the effect of the strike throughout the day, with Today off the air and Breakfast News a shadow of its formal self. By the end of the morning we were all so chilled there was only one option…the pub.